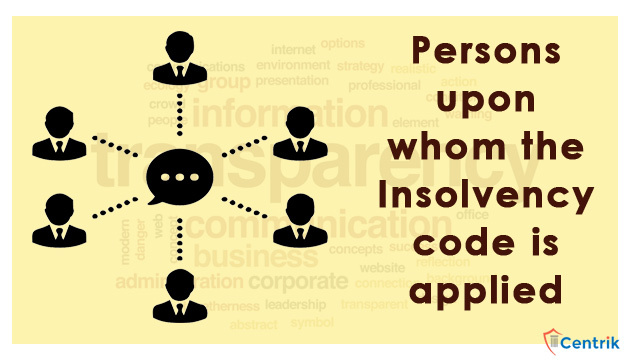 The insolvency and bankruptcy code, 2016 (the code) came into effect from 28.05.2016 but not all the provisions of the code has got effective wherein the code is applicable upon the Persons as well as Corporate Persons. Some of the provisions dealing with Insolvency and Bankruptcy of Individuals, LLPs, Partnership firms has not received the president’s assent till now. Companies incorporated under some special act until any inconsistency arises between the code and that special act; only in that case that special act will prevail over the code. The aforementioned list is inclusive as these are the generic provisions brought under the purview of the Insolvency and Bankruptcy Code, so before filing any petition in NCLT under the code one should be very clear whether the code is applicable on the respondent or not and if the answer is in negative then one might look for any other relief for debt recovery. The code is applicable only upon the corporate persons or persons enlisted herein above and excludes the financial service providers meaning thereby the code is not applicable on the corporate bodies involved in providing financial services. With the upcoming developments and landmark precedents by the National Company Law Tribunal (NCLT) or National Company Law Appellate Tribunal (NCLAT) we can easily come up with the list of the Financial Service Providers upon whom the code is not applicable. When we explore financial service provider the most common and significant image or corporate body we identify is Non-Banking Financial Company (NBFC). The main objective of incorporation an NBFC is to carry out the business of investment Company and has been authorized by the financial sector regulator i.e. RBI to carry the business of providing financial services therefore NBFCs are exempted from the applicability of the code. In Randhiraj Thakur, Director Mayfair Capital Private Limited v. Jindal Saxena Financial Services Private Limited [Company Appeal (AT) (Insolvency) Nos. 32 & 50 of 2018], the National Company Law Appellate Tribunal (NCLAT) held the NBFC to be a financial service provider and thus exempted from being a debtor under the Code. The code is not applicable to corporates in finance sector. Thus no petition shall be entertained by NCLT filed against Banks, Financial Institutions, Insurance Company, Asset Reconstruction Company, Mutual Funds, Collective Investment Schemes or Pension Funds.